Rufus Rand was a war hero and a captain of industry. He earned the Croix de Lafayette for his flying escapades during the first World War, then returned to Minnesota to make his fortune. This he did. Towards the end of the boom he gave us this building, and I can't thank him enough. It's the most New York-style skyscraper we have. Thank the NYC zoning laws. After the massive Equitable building blocked out sunlight for blocks around, laws mandated that buildings step back as they rose, letting sunlight reach the street. This law changed skyscraper design, forcing architects to find new ways to express mass and shape. (Better ways, incidentally.) The law led to style, and the style was repeated in cities that didn't have the law. There was also the Moderne influence - buildings were stripped to their essence, their profile and ornamentation streamlined. 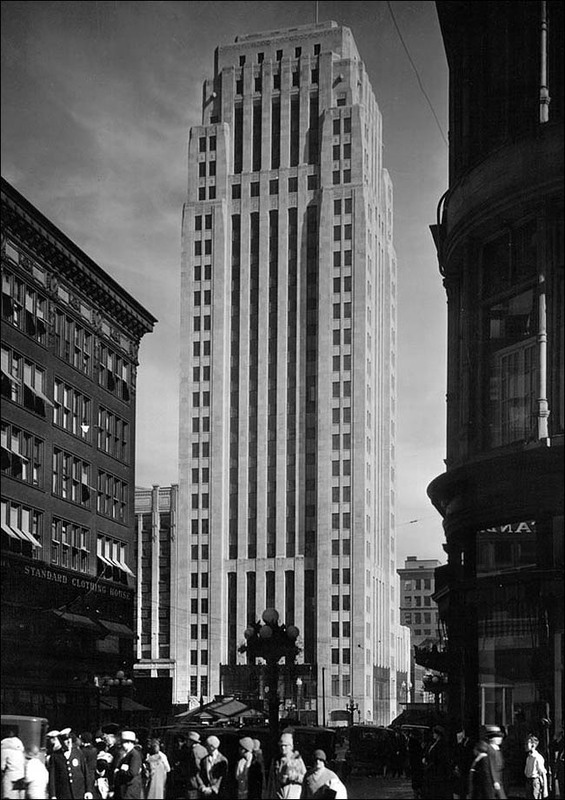 It looks old now, but this was the height of modernity in '28 - a brother to the Chicago Tribune building competition, the Barbicon hotel in New York, and a few others. It would look good ten times as big or half its size.